I think Nick's idea is great. Anything that makes The Mana Drain a more go-to place for that important and exciting aspect of Vintage would further cement the site's centrality to the format. In allowing sites like Facebook to get a handle on the community in any fashion, we weaken the relevance of this site. These comments both define TMD in negative terms. People here have suggested functionality and content they like, but a lot of this is already being done in lots of other places. I haven't heard any consensus on why someone should come to TMD for X, where X is anything besides this used to be TMD. Each reboot of this site has seen TMD's prestige as the place for vintage lessen. Part of this is positive developments from other content producers. The technical implementation will be important and relevant to the larger "what" that TMD becomes. I'd just like to see more thoughts on the "what". (1) I don't know if TMD can be a one-stop-shop anymore. There are enough other quality pockets of Vintage online that maybe TMD could serve as an aggregator. Its effectiveness there would be based on how well it integrates content (general magic news, decklists, tourney results, streams, articles, even key comments) from other places (and how well these are made searchable/tagable/linkable). (2) At its apex, TMD was the place to have robust arguments about the format. This seems to stem from equal parts community/site technics/moderation. I think high-level discussion could be one of the "what" pieces for the next iteration, but changes are needed. The only thing I've seen work online is paid membership. Probably not a popular idea, but people behave better and invest their own quality when they're putting their money where their mouth is. I agree with most of what you have to say, but how I don't see how TMD is not still the place for high level discussion. That's the only reason I'm here, it's the only thing TMD offers that other places don't. I don't see that changing. What would necessitate paid memberships? That thought terrifies me. I started coming to this site when I was 14 (if you couldn't tell by my sweet username), I kept pretty quiet knowing that I was young and stupid and didn't have that much to say on the appropriate level. But the existence of TMD is a large part of why I still play Vintage over a decade later. But if 14 year old me had to pay, or even 20 year old college student me had to pay, I'd have been long gone. I know there are tons of younger people now who are in that same position, and excluding them can't possibly be good for the format. As far as functionality on the site, I love Nick's idea. I also think integrating with MODO/twitch somehow is pretty important. But in addition, there's all of the disparate decklist sites (that are individually incomplete): mtgtop8, tcdecks, mtggoldfish for online results, etc. Bringing all of those into one place would be a welcome addition, especially since TOs often post their lists here anyway. I know next to nothing about programming and such, but would it be possible to have the lists that TOs post in the results forum automatically enter into a database similar to TCDecks? Sorry, I should've clarified a little. I'm not talking about a subscription fee or anything. I'm saying a one-time nominal of $1 or $5 or something. Just enough to keep out the LCD of poster. This is something I've thought about in my head, but don't have the technical knowledge to even put it into words. Something like a TMD Event Reporter, tuned for non-sanctioned/proxy/playtest events that TOs could use, that would 1) run the tournament pairings, but also 2) collect decklists and post them automatically to the new TMD site. Imagine a "TMD decklist editor" tool available on the site, where before the tourney, a player fills it out, prints it (or keeps it on their phone), and all the TO has to do is scan it with her iphone or something and *boop* all the data is there, uploaded to the site. When proxy-gate was going down, there was some (very brief) talk of putting together a rival organization to the DCI, just to run non-sanctioned events. I have fantasies about events "Sponsored by TMD" running smoothly because the tools are well-made, and it's backed by people who make the community great. This kind of fits that bill, but again, I'm just a plebe who doesn't know anything about anything when it comes to the programming infrastructure or work needed to make such things a reality. It seems less to do with separating ones self from the crowd (that's done best by solid posting) and more to do with creating a buy-in and ownership. While it seems like an irrelevant amount, from my personal experience individuals are far more inclined to follow through on something when they have a vested interest in doing so. I.E. less likely to deal with shitposting comparatively to an open site like MTGSalvation. The idea isn't to be exclusionary, if anything we want all the people but just the ones who care enough. 5$ one time fee for creating an account won't break banks and helps support the site, the opportunity cost is low with major potential gains from simple vetting. From an outside perspective, both vintage and TMD are currently viewed as somewhat stodgy, pretentious, slow to evolve and, yes, exclusionary. While I think some of this is good and/or true (we keep a much higher community standard than any other Magic format I've been a part of). it might also contribute to a shortage of new blood in the community. The new blood that may not fully understand the format, may make some awful posts or ask some stupid questions eventually develops into the core community 5 years from now. But I think they're scared to join. It's similar to that argument from the reserve list thread: keep Vintage exclusionary because it's nice as it is, small and manageable with a quality community for the people who are already entrenched. That's awesome now, I guess. But what about 5 years from now? 10? I don't have any stats to back this up, but it would seem that from all metrics Vintage is at an all time high (MODO, Vintage Super League both increasing awareness, record shattering attendance at champs, etc. ), but has TMD itself seen any corresponding uptick? And it's not like there's some competitor site who does have all the high level vintage discussion. Maybe this is just an advertising thing, but maybe it does have to do with our (perceived or real) exclusionary nature. I personally would prefer a board with a 10-20% decrease in overall quality as long as it also brought about an increase in traffic. There is so little discussion on this site now that it pains me; I'll come every day to check it out and sometimes there are zero new posts. Even when something major, like last night's VSL playoffs happened. Strict moderation has worked in the past as a vetting process. If the community were to grow and require more people to handle this task, I'm sure that many of us who care would be up to it. Strict moderation has worked in the past as a vetting process. This coupled with head bumping between "pros" and some of the adepts on this site did a number on our "high quality" user base. If anything, I'd go as far as to say poor moderation is what helped kill TMD. Quality discussion is self regulating when you use multiple tools, moderation is one of those tools but it's no substitution for building a quality foundation. For example, discussions on B&R related things seem to be sometimes locked as a forum policy on TMD? I don't believe such a policy works anymore. In a bygone age, by locking such threads you might effectively stop discussion. These days, people simply take that discussion to other media available such as FB groups. That can consequently lead to people not needing to use TMD as a medium for discussion at all. By strict moderation I was referring to the different user groups, requiring the minimal exam for full access to the forum (is that real still? ), etc. and not necessarily the acts of the moderators themselves. It's the fine balance of being properly "exclusionary" without being off-putting to new people. I'm not really qualified to answer how to handle that one. I'm also unaware of the issue with "pros" you're referring to, but I do get the overall sense that some of the mods/admins, especially the ones who are not particularly active, just come on to lock a thread every now and then. That definitely kills discussion and gives a disincentive to create more. It does create a slightly weird feeling where we want the vetting process to some extent, but also where messing up once removes you from the community and therefore invalidates all the work that had been previously done to establish oneself. Long story short, I think that the people who will join the site will do so in small enough numbers that we really shouldn't have to worry much about a quantity vs. quality issue for a very long time. Even if every person who played in Champs, the large European tournaments and MODO were to regularly post, we'd have a very tiny (relatively) community, with standards mostly reinforced by the fact that we see each other at in person at least once a month. I know also that registration has been down so that could be part of the problem, but are there lots of FB groups that I'm just missing out on or something? Again, not to completely derail you but the Adept System is not something this site should be proud of. To even approach some sort of individual metric system as apposed to that of individual discussions would be a massive failure in my book. Yeah, there's a few Facebook groups. I've really enjoyed TMD for the past 10 or so years I've been using it. I'd like to see more foot traffic and less barriers. I didn't even realize this forum was still accesible until I saw it this Monday. Makes me quite happy to read and talk about Vintage again. Of course I do welcome some changes to this forum, as I think it is far from optimal. Looks too old-fashioned and feels a bit too elite (at least that was my first impression when I had to realize that I can't just create an account like in other forums, instead I had to e-mail an admin and it still took weeks for my account to be activated). feels a bit too elite (at least that was my first impression when I had to realize that I can't just create an account like in other forums, instead I had to e-mail an admin and it still took weeks for my account to be activated). This has nothing to do with being "elite". Admin email is actually a pretty common method of user registration for forums as it's one way to deal with BOTs; particularly if you're running on outdated software like this version of SMF. FWIW... if this is the upper limit to an individual’s patience and willingness to engage a community, then perhaps this is the exact kind of user who will bring very little to the table – thus no real loss. Edit: I will agree that a weeks long lag time is unacceptable. One of the big things I would like to see is a way to turn my old vintage encyclopedia project into a community project. I know it has been used in the past to get new players to look at the format and has gotten older, semi-retired players to think about coming back. I know there are still many people willing to do a lot of work on it. I feel like community projects like the encyclopedia are in line with the direction this site is heading. If there is a way to make a post so that it is able to be edited by anyone, I think that would work. I currently have all the posts in that thread saved as individual notepad files if that is of any use, I would be happy to email them or put them up on a file share site. Another idea I would like to see is a map (US and world) with LGS that run vintage events and their information. No clue how we would do it, but it would be a great tool for anyone looking to start out. And to add to that the ability to tag yourself as a regular attendee of a shop so people can easily message each other to form playtest groups. If we want vintage to survive we must continually strive to build our community. +1 for maps, especially for tourney related information. I'd also vote for less boards on the forum (whatever shape it an assumed forum portion would take). The are almost 30 boards, and less then 200 users on at peak. A financial section with price ticker. Maybe someone to write articles about financial speculation once a month or so. I'm totally in favor of a change for good. I'm also of the opinion that there needs to be more quality content and we should start to share more and get back to being the point of reference in terms of Vintage discussions, new tech and trends. I often find myself checking for deck lists in TC decks or MTG goldfish and not going to the source of the changes on the archetypes: The discussions topics showing the points of view of the people who play that very same lists. We are currently in a positions where we are isolated individuals that get the final product (aka deck lists) without any explanation of any kind. What does this lead to? To a static format that does not evolve. We keep on playing same deck lists and the shifts in trends are very very slow. So some people leave because they get bored or because we are getting more of the same. To fight all this, I am committed to try to lure some of the LCV players into the forum to try to share and comment more, as I know some would love to. However, there seems to be a total lack of interest on the results and deck lists we post. I am really sorry to see that despite being the oldest and biggest monthly league in the world, the LCV does not rise any kind of comments or discussions of any nature among the TMD users. This is really demotivating. This is just a reflection of the position TMD holds now: A lot of people could be sharing and talking but there seems to be no feedback, so the content creation is unidirectional and does not respond to any need. All in all, it seems to be a great moment to be playing Vintage, let's see what the future holds for our community (and TMD). I agree the basic premise - that evolution of new stuff is slow and introduction of new members and new ideas is rough on the new people. But short of a heavy-handed moderation I'm not sure what can be done about this. I dont think those issues are actually TMD (site) related. For one, T1 has always been and always will be slow to evolve because of the vast number of cards available. It takes the kind of card that is printed only every few sets to spawn a new archetype. The most powerful cards ever made are available and basically they need to be beat or a game rule needs to be broken (like dredge or oath) to innovate something completely new. Second, whenever somebody does try to innovate they get beat down. There are people who will be encouraging. But there are some who are set in their ways and wont give something new a chance unless 'it has tournament results.' I think that is a community problem that the site admins have little control over. The content on this site is very results driven. That in and of itself is not a bad thing. We are, after all, here to discuss competitive T1 and what better way to determine competitive than with results? But innovation on this site really gets stifled. Which is a shame. Because nobody puts together a new deck, takes it to a tournament and wins. They play test it. Revise it, revamp it. Alter it, tweak it etc. But there are very vocal people on this site who don't seem to want to give this process a chance. "Show me a tournament victory or shut up," mentality. Perhaps a forum specifically for innovation discussions would be helpful. But people will have to watch their attitudes there. Tournament reports themselves are also very lacking. Showing a deck list and saying, "I won round 1 game 1 when I resolve oath and got grislebrand out." isn't actually helpful. How about pushing people to discuss each round? 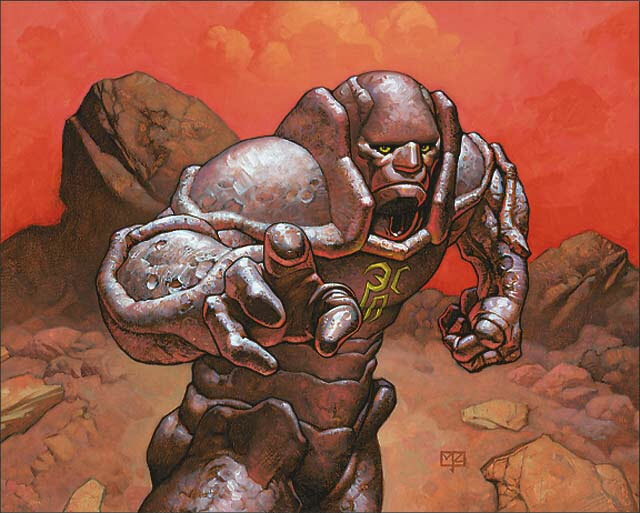 "I had an opening hand w/ orchard, mox, oath but opted not to push right away because X factor." Again, this is not something the TMD staff can do much about but for those who would like to see quality content its certainly something that the users can do something about. This would directly help in elevating the content of the site to an elite level. This is something the community can do to help itself get back to being the point of reference for the T1 community. The problem with most "innovation" on this site is that it lacks quality, not results. If you go to the recent thread on Brain in a Jar, the two scenarios given as incentives to play the card are actually pretty terrible. Later, on a different point, one person said to me "I didn't say it was good, I just said it was possible." Three people have asked how the card interacts with Spheres. This isn't quality discourse. I am more than willing to embrace new and crazy ideas but I would like logic and reasoning behind it. Agreed. But how do we, as a community, foster that discourse? That's the million dollar question. Like Godder said, it comes from the people using the forums and is largely independent of what administration does. It's been frustrating though watching people I respected give up on this forum and not post anymore. And I know my frustration comes out in some of my posts. You're never going to pull people away from sites like MTGtS. Specifically aiming for that goal does nothing for the community we are actually trying to serve. Regarding quality discussion; from my perspective most of this lies in the lack of content. Content has always been a rather hard thing to produce in meaningful quantities on a consistent basis. Surface level, content creation seems to be hampered by the frequency at which the format is shaken up by either B&R changes or printings that are actually able to penetrate the format. Throw in the cyclical nature of Vintage, in that most everything has been discussed into the ground regarding established archetypes and you can see why discussion suffers. The drain has still been a good place to find tournament reports, deck lists, and a place to discuss the direction of the format (like this thread). It would be nice if the drain could be more of course.